From majestic forts and palaces to sprawling markets full of decade-old shops selling the best ghewar you’ll ever eat, Jaipur-darshan offers views, food and experiences meant for everyone. 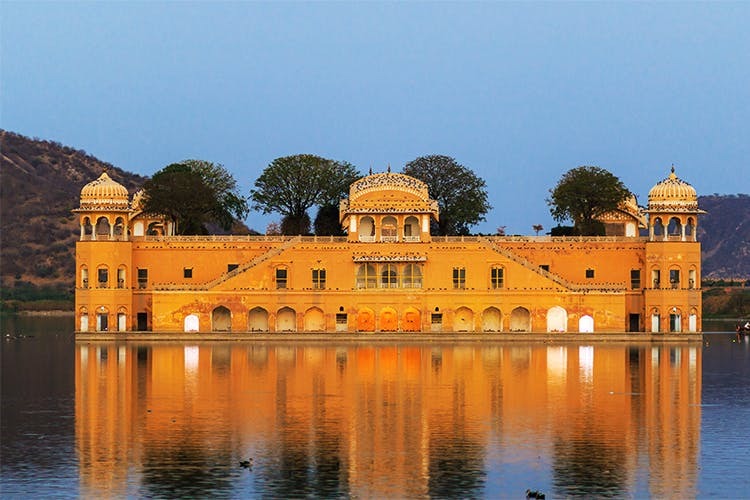 However, if you’re in this royal city for just one day (or one extra day post JLF), we’re telling you some of the places that you absolutely cannot miss to enjoy the ultimate 24 hours in Jaipur. Hawa Mahal definitely is this city’s most iconic landmarks and being pink-coloured, it probably best embodies Jaipur’s architecture. Another architectural and historical gem in close proximity to the Hawa Mahal is the City Palace. Not only does the Jaipur City Palace display the life of the Royal Rajput families, it also houses an art and textile museum that has preserved various artifacts, manuscripts and precious stones for over centuries. Next, visit the Amer Fort, overlooking the Maota Lake and trudge to the top on an elephant (you can take a jeep, too) to a view that will take your breath away. Make it a point to visit the chamber of a thousand mirrors in the fort that redefines grandeur in every possible way. On your way back from Amer to Jaipur, you might want to make a stop near Jal Mahal for a photo op. Lastly, reserve some time for the rustic Nahargarh Fort that houses the Sheesh Mahal, the recently-opened wax museum and a rooftop restaurant where you can grab a chilled beer. Start your day with a hearty breakfast of pyaaz kachori, paratha and ghewar at Lakshmi Mishthan Bhandar—and do grab a glass of lassi from any of the legendary lassiwalas in the city – yep, there are so many. An authentic Rajasthani lunch would be incomplete without laal maas and daal bhati churma and the best place that offers mouth-watering traditional meals is Spice Court. This place offers the most tender meat in rich red-gravy (Laal Maas) and their Daal Bati is the perfect combination of ghee drenched wheat/bajra balls with flavourful dal. In the evening, chill and browse through the pictures you clicked at cafes like Tapri Central and The Laughing B before you head out again to explore the rest of Jaipur. Finally, grab a dinner at the iconic Niro’s (or Chokhi Dhani if you have time) and end your trip with a big, fat, Rajasthani meal. One cannot get enough of the Baapu Bazaar, which is one of Jaipur’s most famous markets for home decor items, fabrics, juttis, Jaipuri quilts and make sure that you check out the exquisite leheria stoles and saris there, too. Also, visit the Natraj Restaurant, if you have enough room for delish dahi vada and kachoris. And you cannot leave the city without checking out the famous, Jaipuri glazed blue pottery work at Kripal Kumbh in Bani Park. For meenakari jewellery, Bandhni and block print fabrics, head to Gopalji Ka Rasta in Johari Bazaar, where you’re sure to be spoiled for choice. Zostel is always our go-to affordable accommodation that offers all the amenities like free Wi-Fi, lockers, free parking facility, towels, AC and more, to ensure the most comfortable stay in any city, but at half the price of the mid-range hotels. The Zostel Jaipur is an award-winning hostel that has beautifully decorated dorm rooms, common areas with books and comfortable seating and is located close to tourist spots like Hawa Mahal. Cosy, clean rooms, great breakfast and coffee, and situated at a location preferred by travellers, Rawla Rawatsar is one of the best value-for-money properties in Jaipur. From table covers and cutlery, to beds and sofas, we love how every corner of the hotel looks charming and vibrant. Other than all the amenities that this hotel offers, we’re pretty sure that it’ll also give you tonnes of Instagram-worthy pictures to take back. Umaid Bhawan is nothing short of a palace in itself. Be it the dining hall with massive chandeliers, the rooms with painted ceilings and doorways or the stunning courtyards and open-air restaurants, every space in this hotel looks royal, and won’t fail to impress you. When you do manage to get out of your luxe suite, chill by their pool or take a tour of the hotel itself (yes, it’s that massive), there won’t ever be a dull moment when you’re staying at the Umaid Bhawan.